A new coffee bean find for me is Bird Rock Coffee Roasters, a micro-roaster based out in La Jolla, California. What I like a lot about this coffee roaster, beyond the fact they purchase the best possible green coffee beans from various regions around the world and directly from the farmers, is the fact they give back to the local community within the coffee growing region as most regions are under corrupt or oppressive governments that overlooks the underserved. For example, Bird Rock Coffee supports the Change the Truth organization. This organization supports the needs of the children at St. Mary Kevin Orphanage Motherhood in Kajjansi, Uganda. So it’s a brand that sells you great coffee with a conscience. 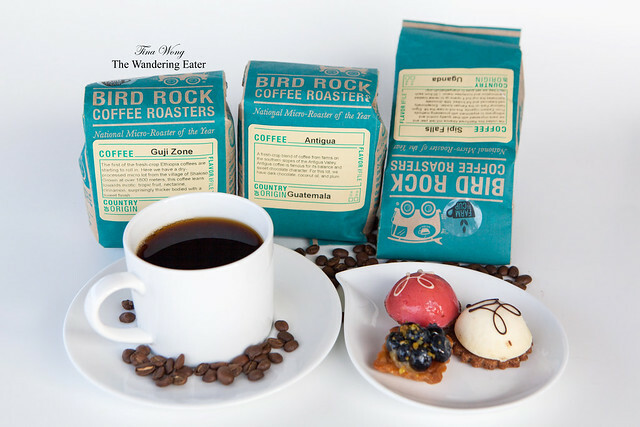 My recent cups of coffee from Bird Rock are all generally on the lean, acidic and fruity category rather than the smooth, rich-bodied profiles. The Ugandan beans from Sipi Falls is similar to a Kenyan coffee with bold acidity with a crisp finish, but it’s aromas are chocolate-y and black currants. Thick bodied and satisfying. The Guatemala, Antigua beans had floral, caramel sweetness. Their recent pride and joy is the Ethiopia, Guji Zone as they earned a 95 rating from Coffee Review. These beans are dry-processed coffee, meaning the beans were dried inside the coffee berry, encouraging a flavor profile that is sweeter and deeper-toned than the more familiar wet-processed floral and citrus-toned southern Ethiopia profile that gives the palate a bright, fruity, complexly sweet, with a slightly fermented aftertaste. Le Creuset’s French Press Pot Review & Giveaway!